Lyla June is a musician, poet, anthropologist, educator, community organizer and public speaker. More than anything though she is a true warrior of love. Lyla descends from both Diné (commonly known as Navajo) and European ancestors. Her story is one of deep healing from her own trauma and that of the generations before her. She has long worked hard to carry forward the wisdom of the people native to the North American continent (also known as Turtle Island) as well as uncover the history of her European ancestors.. Her life and research has shown us that we are all on a healing journey, and that we all have an opportunity to remember our deep humanity and connection with the earth. We all descend from healers and it is time for us to remember that. The parallels between the genocide of Indigenous Europeans and Native Americans are astounding. It boggles my mind that more people don't see how we are the same people, who have undergone the same spiritual assault. The only difference between the Red Story and the White Story is we are in different stages of the process of spiritual warfare. Native Americans are only recently becoming something they are not. They are only recently starting to succumb to the temptations of drugs, alcohol, gambling, self-destruction and the destruction of others. Just as some Native American people have been contorted and twisted by so many centuries of abuse, so too were those survivors of the European genocide. Both are completely forgivable in my eyes. Here is Lyla June performing at Thrive East Bay, where I first saw her. 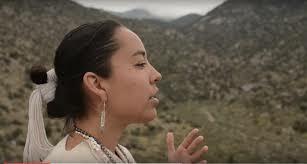 The first video is “Mamwlad.” The second video is about “Unity and Hozho.” Hozho is a powerful concept in Diné Bizaad (the language of the Diné (Navajo) people).